I’m excited to focus this spring and summer on the marvelous farms of Bucks County, PA. These are the farms I feel proud to patronize. It’s not only important to support our local farmers, but shopping locally is also a vital part of our planet’s sustainability. Look for more farm series features coming soon. 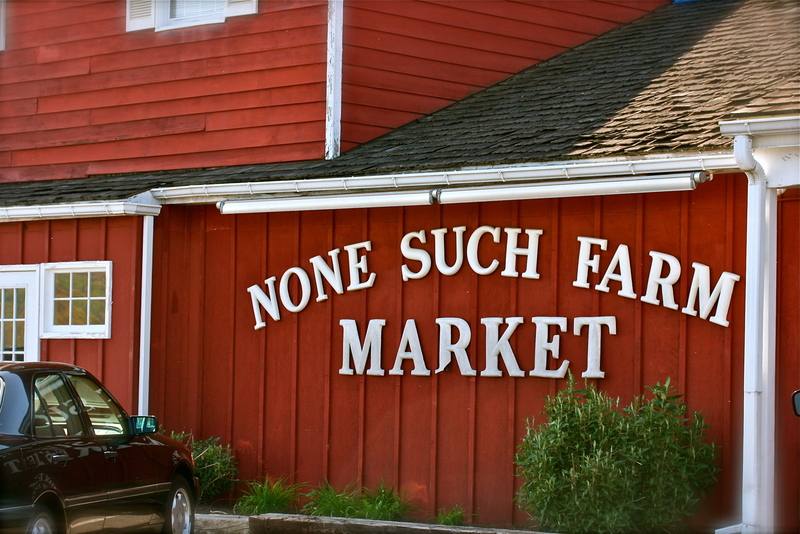 None Such Farms was our first stop. 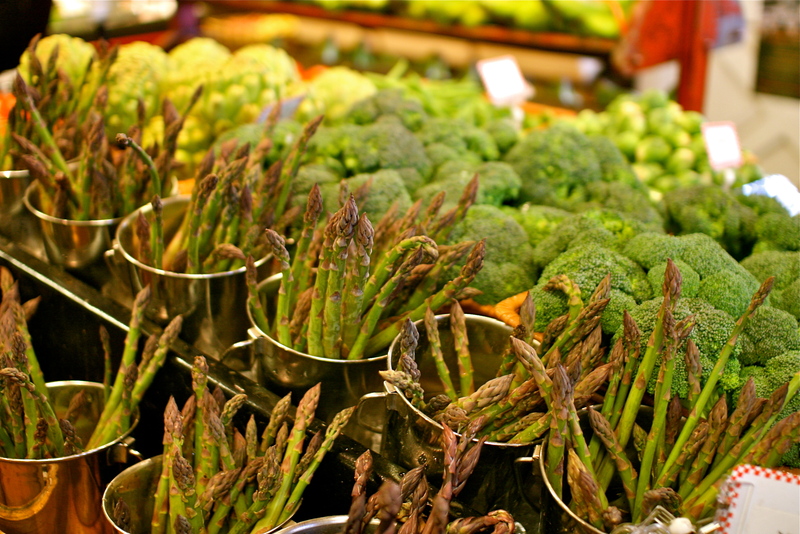 The first spring crop I look forward to is local asparagus from None Such Farms. Much to my surprise, the first stalks appeared a little early this year. Yes, I was watching the calendar. I knew that last year’s asparagus didn’t show up until April 26th. Ok, truth be told, there’s a sign outside the front door of the farm with last year’s crop dates, but I like to think I’m in touch with my inner farmer. 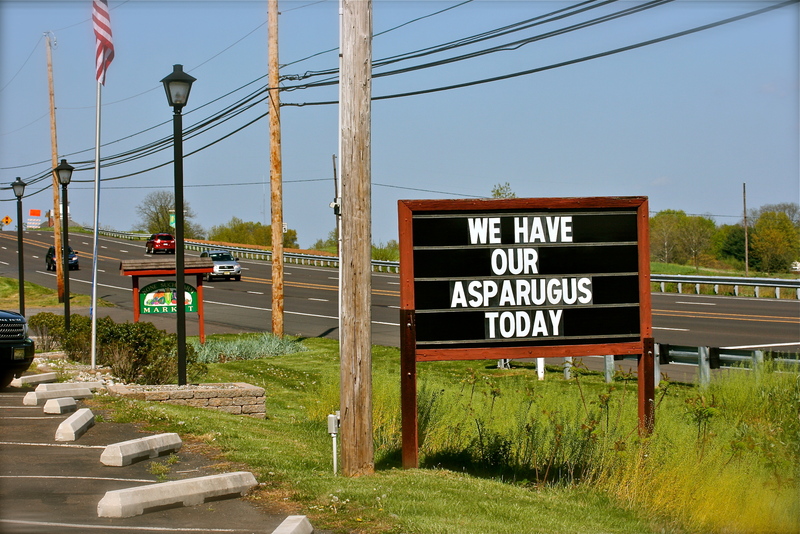 When I pulled into None Such on April 19th and their sign read “we have asparagus,” it was like a glorious present. None Such is a family owned and operated farm that provides fruits, vegetables, farm raised beef and flowers. They grow some of the sweetest corn, tomatoes, strawberries, and a whole host of other fresh produce throughout the season. When I reference going to my local farm to pick up various ingredients to make dinner, I’m usually referring to None Such Farms. The market also has a fantastic assortment of fresh-baked goods, gourmet edibles, cheeses and prepared foods. Their ground beef is the best! When I’m not feeling up to making homemade basil pesto, None Such homemade pesto is a great cheat. For today, asparagus gets all my love and attention. 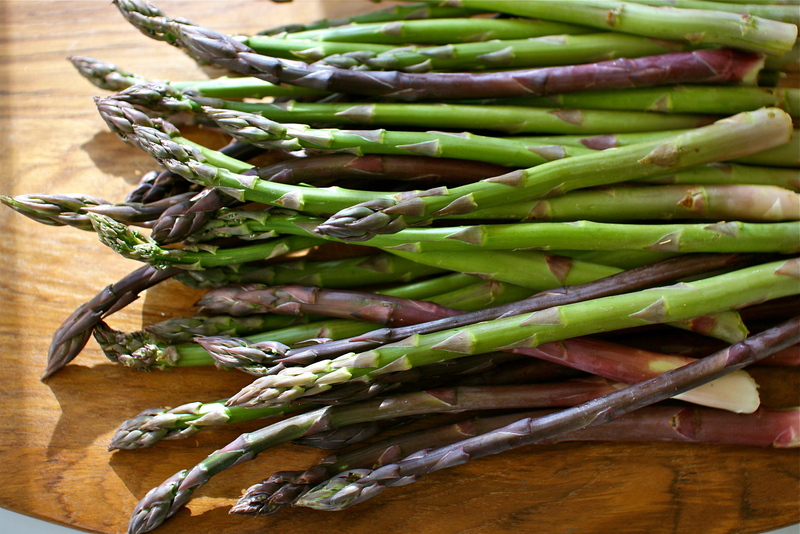 The purple asparagus stalks turn a dark green color when cooked, and have a slightly milder flavor than the green. Heat a dutch oven over medium-high heat and add the butter and oil. Once the butter is melted, add the asparagus and leeks, cooking until softened but not browned. Add the garlic, cook until fragrant – about a minute. Season with kosher salt and pepper to taste and add red pepper flakes, if using. Stir and add the chicken stock, thyme and chopped basil. Bring to a boil and reduce to a simmer, partially covered for about 15 minutes, or until the asparagus is tender. You don’t want the asparagus to become mushy. Check it at 10 minutes. When a fork pokes easily into the asparagus, it’s done. It should still retain a vibrant green color. Remove the thyme bundle and squeeze in the juice of half a lemon. Turn off the heat and using an immersion blender, purée the soup until it’s smooth and creamy. Taste for reseasoning with additional salt and pepper. Heat the canola oil in a small skillet over medium-high heat. Add the sliced shallots, separating them into rings as you drop them into the oil. Move them around so they cook evenly. Once they turn golden brown, use a slotted spoon to remove them from the pan, and place on a paper towel lined plate to drain. You may need to work in batches, so you don’t overcrowd the pan. Sprinkle the crispy shallots with Kosher salt when they are done. 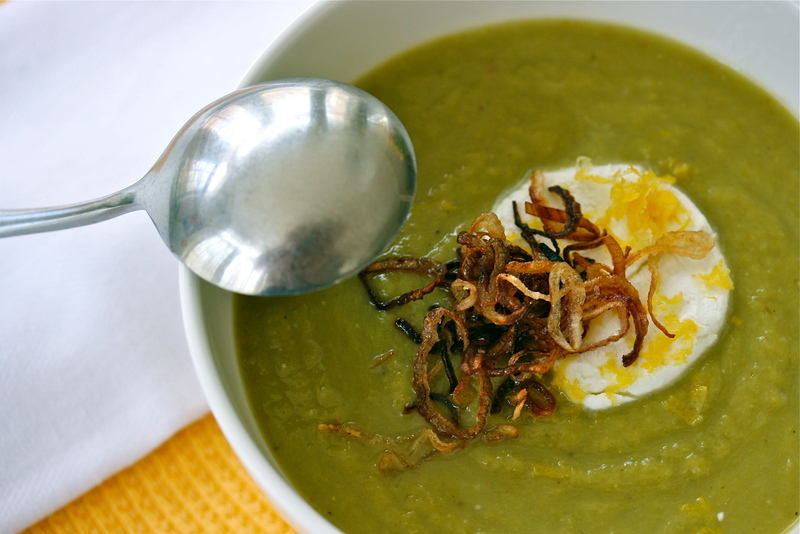 Ladle the soup into bowls, place a goat cheese round on the top of the soup, sprinkle with the crispy shallots and a little fresh lemon zest. * Here’s a tip… use a piece of unwaxed/unflavored dental floss to slice the goat cheese into rounds. It will prevent the cheese from crumbling. I’ve lived in our little town of New Hope for essentially my entire life. There aren’t many real natives living here anymore. Few of us are still around to remember the open fields that are now filled with homes, and the quirky artistic town as it was back in the 70’s and 80’s. It’s very different now. Not to say it’s better or worse, just different. One thing remains the same, New Hope and Lambertville still offer some of the best restaurants in the greater Philadelphia area. We love Karla’s. 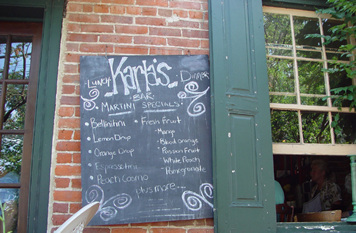 Cozy and full of locals, Karla’s offers some of the best fare in town. With the warm weather here to stay, sitting on the open air patio at Karla’s, people watching and sipping one of their fresh fruit martini’s is a perfect way to spend an afternoon or evening. Dinners at Karla’s are always consistently delicious. Fresh and prepared while you wait, Karla’s menu includes steaks, seafood, pastas and more, all with a Mediterranean twist. I love their fresh grilled salmon and their tender braised short ribs and scallops over risotto… simply decadent. Their house salad with Thai vinaigrette is my favorite salad in town. The dressing is light and fresh with perfect Thai seasonings. How can a simple house salad taste so good? I wonder if they’d share the recipe with us? If you’re looking for something a bit simpler, Karla’s serves a killer burger and house cut french fries. The smoky pulled chicken chipotle quesadilla and the Greek salad are perfect choices for a light lunch or as a starter. There are always nightly specials offered as well. As I casually mentioned their fresh fruit martini’s above, I should be giving you a warning. These drinks are lethal. Maybe my alcohol tolerance isn’t what it used to be, but I can only drink one of Karla’s martini’s. It’s water for the rest of the night after a single cocktail. I’ve been told that there is 8oz of alcohol in each martini. I wonder if it’s true? That’s a lot of vodka! The lemon drop martini is my favorite. It’s so fruity and delicious… very deceiving. You’ve been warned! Pick your designated driver before you get there. Karla’s still offers a locals night, full moon dance parties and Sunday brunch. 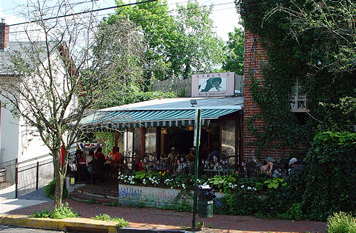 If you’re heading into New Hope for the day, add this to your list of places for lunch, dinner or at the very least, stop by for a martini on the veranda. Bucks County locals who haven’t been to Karla’s, shame on you! Now is the perfect time to go.